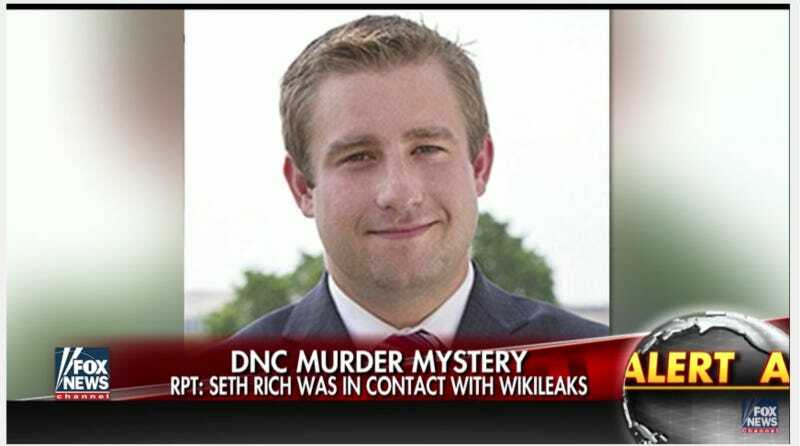 Fox News allowed a private investigator who briefly worked for the family of murdered DNC staffer Seth Rich to suggest that Rich was killed because he leaked DNC emails to Wikileaks. In July 2016, the then 27-year-old was shot to death just blocks from his home in Washington, D.C. The murder remains unsolved, and the D.C. Metro Police suspect he may have been the victim of a botched robbery. But a host of conspiracy theorists have decided that Rich was murdered by the DNC or Hillary Clinton herself for Knowing Too Much. The report is being touted as something new, and even mainstream and usually non-credulous reporters are clustered around it on Twitter as though it might mean something. That’s likely adding to the grief and frustration of the Rich family, who have expressed fears to both the Washington Post and Newsweek that they may never solve Seth’s murder, now that the case is clogged with the services of self-appointed detectives hell-bent on pinning it on the Clintons or the DNC. As we’ve seen through the past year of unsubstantiated claims, we see no facts, we have seen no evidence, we have been approached with no emails and only learned about this when contacted by the press. Even if tomorrow, an email was found, it is not a high enough bar of evidence to prove any interactions as emails can be altered and we’ve seen that those interested in pushing conspiracies will stop at nothing to do so. We are a family who is committed to facts, not fake evidence that surfaces every few months to fill the void and distract law enforcement and the general public from finding Seth’s murderers. The services of the private investigator who spoke to press was offered to the Rich family and paid for by a third party, and contractually was barred from speaking to press or anyone outside of law enforcement or the family unless explicitly authorized by the family. It’s sad but unsurprising that a group of media outlets who have repeatedly lied to the American people would try and manipulate the legacy of a murder victim in order to forward their own political agenda. I think there is a special place in hell for people like that. Rich’s death has been an object of fascination for conspiracy theorists since last summer. Within days of his death, as the Post and others have reported, he became the subject of a number of increasingly dark theories, namely that he had leaked DNC emails to Wikileaks and was gunned down on his way to meet with the FBI to testify against Hillary Clinton. Soon after, Julian Assange hinted that Rich was indeed Wikileaks’ source, and offered a reward to solve Rich’s murder. And echoed in the right-wing mainstream by people like Tomi Lahren, who suggested that the Clintons had Rich killed. Right-wing news outlets like Heat Street, Breitbart and Zero Hedge have repeated the rumors as well. It’s also worth noting that Rod Wheeler, the investigator who briefly worked for the family, is best known as a former cop and sometimes Fox News contributor who once claimed that gangs of lesbians are stalking the streets recruiting children. Not ones to miss an opportunity to chime in, conspiracy hive InfoWars suggested today that the Washington Post’s report that Donald Trump shared classified information with Russia was a cover-up to distract from the latest “Seth Rich bombshell,” as they put it. InfoWars editor-at-large Paul Joseph Watson has spent the past 12 hours or so busily accusing the mainstream media of a cover-up. At the time of his death, Rich had been at the DNC for two years, working as the Voter Expansion Data Director. His family told the Washington Post he was chatty, a snappy dresser with a “goofy grin,” and utterly politics-obsessed, the kind of guy who watched C-Span for fun.